The Range Expander, combined with a Montalvo Z4 controllers can optimize the performance of a multi-range brake system to provide the widest range of torque, and the widest controllable tension range possible. One of the keys to good tension control is to keep the regulated control output to the torque device in a favorable range, meaning high enough to effectively manage tension especially as the unwinding roll approaches the core. Single-range systems may have brakes that are properly sized to effectively stop the roll and dissipate the heat generated, but may be oversized with respect to torque capacity, particularly in low tension applications, or where the difference between maximum roll diameter and core is large (6:1 to 10:1 or greater ratios). The range expander automatically removes selected brake pads, reducing the torque capacity of the brake, requiring the controller to increase the output to generate the same torque level and maintain tension. This puts the controller back into a favorable output range. Since the controller knows the torque level prior to and after the pad(s) is removed, it increases the controller output by the appropriate level so that the tension does not change during transition. The controller and range expander will also add pads back in if the torque required for a fast stop exceeds the torque capacity of the current range. This system is particularly advantageous in applications where the unwind rolls are large and heavy, but the material is relatively light and the tension requirements are low. Can I use this with any of your controllers? 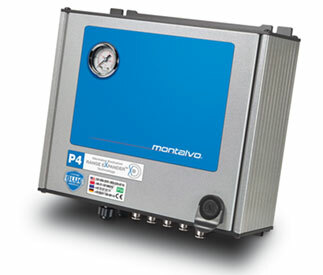 The Range Expander is only supported by the Montalvo Z4 and HD controllers. Does this automatically disengage pads from my brake? The pads are automatically disengaged from the brake based on unwind roll diameter or controller output level for optimum tension control from full roll to the core. The controller and range expander combination can also randomize the pad activation/deactivation, thereby increasing pad life and increasing intervals between pad changes.